The 75-year-old singer was named the shock winner of the prize last week. But all efforts by the Swedish Academy to contact him have failed, and he has not acknowledged the win in public. 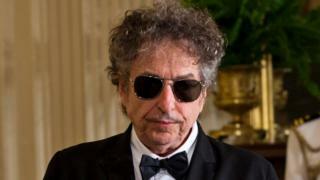 Academy member Per Wastberg told Swedish television: "He is who he is," adding that there was little surprise Dylan had ignored the news. "We were aware that he can be difficult and that he does not like appearances when he stands alone on the stage," he told Sweden's Dagens Nyheter newspaper in a separate interview. A reference to the prize was removed from Dylan's website last week. It is still not known if he will travel to Stockholm to receive the prize on 10 December. If he does not, a ceremony marking his career will go ahead as planned, Mr Wastberg said. Mr Wastberg called the snub "unprecedented", but one person has previously rejected the Nobel Prize in Literature - French author and philosopher Jean-Paul Sartre in 1964. And one other recipient was distinctly underwhelmed by the honour conferred upon her by the Swedish Academy. On learning she had won the prize in 2007, having returned from doing her shopping, the author Doris Lessing responded: "Oh Christ." However, she did attend the ceremony later that year.